This document describes version 3.0 and newer of the Linux Diagnostic Extension. For information about version 2.3 and older, see this document. Collects system performance metrics from the VM and stores them in a specific table in a designated storage account. Retrieves log events from syslog and stores them in a specific table in the designated storage account. Enables users to customize the data metrics that are collected and uploaded. Enables users to customize the syslog facilities and severity levels of events that are collected and uploaded. Enables users to upload specified log files to a designated storage table. Supports sending metrics and log events to arbitrary EventHub endpoints and JSON-formatted blobs in the designated storage account. This extension works with both Azure deployment models. You can enable this extension by using the Azure PowerShell cmdlets, Azure CLI scripts, ARM templates, or the Azure portal. For more information, see Extensions Features. enable the Azure portal experience for charting and alerting on VM metrics. The downloadable configuration is just an example; modify it to suit your own needs. Azure Linux Agent version 2.2.0 or later. Most Azure VM Linux gallery images include version 2.2.7 or later. Run /usr/sbin/waagent -version to confirm the version installed on the VM. If the VM is running an older version of the guest agent, follow these instructions to update it. Azure CLI. Set up the Azure CLI environment on your machine. The wget command, if you don't already have it: Run sudo apt-get install wget. An existing Azure subscription and an existing storage account within it to store the data. The URL for the sample configuration, and its contents, are subject to change. Download a copy of the portal settings JSON file and customize it for your needs. Any templates or automation you construct should use your own copy, rather than downloading that URL each time. After you've changed your Protected or Public settings, deploy them to the VM by running the same command. If anything changed in the settings, the updated settings are sent to the extension. LAD reloads the configuration and restarts itself. The latest version of the extension is 3.0. Any old versions (2.x) are deprecated and may be unpublished on or after July 31, 2018. This extension introduces breaking changes to the configuration of the extension. One such change was made to improve the security of the extension; as a result, backwards compatibility with 2.x could not be maintained. Also, the Extension Publisher for this extension is different than the publisher for the 2.x versions. To migrate from 2.x to this new version of the extension, you must uninstall the old extension (under the old publisher name), then install version 3 of the extension. Install the extension with automatic minor version upgrade enabled. On classic deployment model VMs, specify '3. *' as the version if you are installing the extension through Azure XPLAT CLI or Powershell. On Azure Resource Manager deployment model VMs, include '"autoUpgradeMinorVersion": true' in the VM deployment template. LAD 3.0 stores syslog events in a table with a different name. The counterSpecifier strings for builtin metrics differ in LAD 3.0. This set of configuration information contains sensitive information that should be protected from public view, for example, storage credentials. These settings are transmitted to and stored by the extension in encrypted form. storageAccountName The name of the storage account in which data is written by the extension. storageAccountEndPoint (optional) The endpoint identifying the cloud in which the storage account exists. If this setting is absent, LAD defaults to the Azure public cloud, https://core.windows.net. To use a storage account in Azure Germany, Azure Government, or Azure China, set this value accordingly. storageAccountSasToken An Account SAS token for Blob and Table services (ss='bt'), applicable to containers and objects (srt='co'), which grants add, create, list, update, and write permissions (sp='acluw'). Do not include the leading question-mark (?). mdsdHttpProxy (optional) HTTP proxy information needed to enable the extension to connect to the specified storage account and endpoint. sinksConfig (optional) Details of alternative destinations to which metrics and events can be delivered. The specific details of each data sink supported by the extension are covered in the sections that follow. 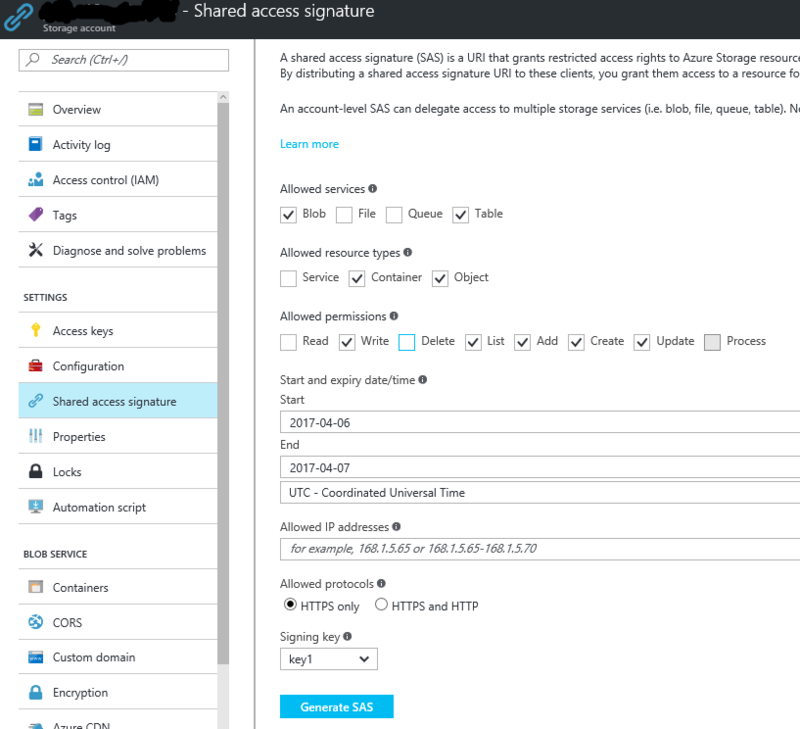 When deploying the extension with an Azure deployment template, the storage account and SAS token must be created beforehand and then passed to the template. You can't deploy a VM, storage account, and configure the extension in a single template. Creating a SAS token within a template is not currently supported. You can easily construct the required SAS token through the Azure portal. Click the "Generate SAS" button. Copy the generated SAS into the storageAccountSasToken field; remove the leading question-mark ("?"). This optional section defines additional destinations to which the extension sends the information it collects. The "sink" array contains an object for each additional data sink. The "type" attribute determines the other attributes in the object. name A string used to refer to this sink elsewhere in the extension configuration. type The type of sink being defined. Determines the other values (if any) in instances of this type. Version 3.0 of the Linux Diagnostic Extension supports two sink types: EventHub, and JsonBlob. For more information about generating SAS tokens for Event Hubs, see this web page. Data directed to a JsonBlob sink is stored in blobs in Azure storage. Each instance of LAD creates a blob every hour for each sink name. Each blob always contains a syntactically valid JSON array of object. New entries are atomically added to the array. Blobs are stored in a container with the same name as the sink. The Azure storage rules for blob container names apply to the names of JsonBlob sinks: between 3 and 63 lower-case alphanumeric ASCII characters or dashes. This structure contains various blocks of settings that control the information collected by the extension. Each setting is optional. If you specify ladCfg, you must also specify StorageAccount. StorageAccount The name of the storage account in which data is written by the extension. Must be the same name as is specified in the Protected settings. mdsdHttpProxy (optional) Same as in the Protected settings. The public value is overridden by the private value, if set. Place proxy settings that contain a secret, such as a password, in the Protected settings. The remaining elements are described in detail in the following sections. This optional structure controls the gathering of metrics and logs for delivery to the Azure Metrics service and to other data sinks. You must specify either performanceCounters or syslogEvents or both. You must specify the metrics structure. eventVolume (optional) Controls the number of partitions created within the storage table. Must be one of "Large", "Medium", or "Small". If not specified, the default value is "Medium". sampleRateInSeconds (optional) The default interval between collection of raw (unaggregated) metrics. The smallest supported sample rate is 15 seconds. If not specified, the default value is 15.
resourceId The Azure Resource Manager resource ID of the VM or of the virtual machine scale set to which the VM belongs. This setting must be also specified if any JsonBlob sink is used in the configuration. scheduledTransferPeriod The frequency at which aggregate metrics are to be computed and transferred to Azure Metrics, expressed as an IS 8601 time interval. The smallest transfer period is 60 seconds, that is, PT1M. You must specify at least one scheduledTransferPeriod. Samples of the metrics specified in the performanceCounters section are collected every 15 seconds or at the sample rate explicitly defined for the counter. If multiple scheduledTransferPeriod frequencies appear (as in the example), each aggregation is computed independently. sinks (optional) A comma-separated list of names of sinks to which LAD sends aggregated metric results. All aggregated metrics are published to each listed sink. See sinksConfig. Example: "EHsink1, myjsonsink". type Identifies the actual provider of the metric. class Together with "counter", identifies the specific metric within the provider's namespace. counter Together with "class", identifies the specific metric within the provider's namespace. counterSpecifier Identifies the specific metric within the Azure Metrics namespace. condition (optional) Selects a specific instance of the object to which the metric applies or selects the aggregation across all instances of that object. For more information, see the builtin metric definitions. sampleRate IS 8601 interval that sets the rate at which raw samples for this metric are collected. If not set, the collection interval is set by the value of sampleRateInSeconds. The shortest supported sample rate is 15 seconds (PT15S). unit Should be one of these strings: "Count", "Bytes", "Seconds", "Percent", "CountPerSecond", "BytesPerSecond", "Millisecond". Defines the unit for the metric. Consumers of the collected data expect the collected data values to match this unit. LAD ignores this field. displayName The label (in the language specified by the associated locale setting) to be attached to this data in Azure Metrics. LAD ignores this field. Neither LAD nor the Azure portal expects the counterSpecifier value to match any pattern. Be consistent in how you construct counterSpecifier values. Examples include WADMetricsPT1HP10DV2S20170410 and WADMetricsPT1MP10DV2S20170609. This optional section controls the collection of log events from syslog. If the section is omitted, syslog events are not captured at all. The syslogEventConfiguration collection has one entry for each syslog facility of interest. If minSeverity is "NONE" for a particular facility, or if that facility does not appear in the element at all, no events from that facility are captured. sinks A comma-separated list of names of sinks to which individual log events are published. All log events matching the restrictions in syslogEventConfiguration are published to each listed sink. Example: "EHforsyslog"
facilityName A syslog facility name (such as "LOG_USER" or "LOG_LOCAL0"). See the "facility" section of the syslog man page for the full list. minSeverity A syslog severity level (such as "LOG_ERR" or "LOG_INFO"). See the "level" section of the syslog man page for the full list. The extension captures events sent to the facility at or above the specified level. Examples include LinuxSyslog20170410 and LinuxSyslog20170609. This optional section controls execution of arbitrary OMI queries. namespace (optional) The OMI namespace within which the query should be executed. If unspecified, the default value is "root/scx", implemented by the System Center Cross-platform Providers. query The OMI query to be executed. table (optional) The Azure storage table, in the designated storage account (see Protected settings). frequency (optional) The number of seconds between execution of the query. Default value is 300 (5 minutes); minimum value is 15 seconds. sinks (optional) A comma-separated list of names of additional sinks to which raw sample metric results should be published. No aggregation of these raw samples is computed by the extension or by Azure Metrics. Either "table" or "sinks", or both, must be specified. Controls the capture of log files. LAD captures new text lines as they are written to the file and writes them to table rows and/or any specified sinks (JsonBlob or EventHub). file The full pathname of the log file to be watched and captured. The pathname must name a single file; it cannot name a directory or contain wildcards. table (optional) The Azure storage table, in the designated storage account (as specified in the protected configuration), into which new lines from the "tail" of the file are written. sinks (optional) A comma-separated list of names of additional sinks to which log lines sent. The Processor class of metrics provides information about processor usage in the VM. When aggregating percentages, the result is the average across all CPUs. In a two-vCPU VM, if one vCPU was 100% busy and the other was 100% idle, the reported PercentIdleTime would be 50. If each vCPU was 50% busy for the same period, the reported result would also be 50. In a four-vCPU VM, with one vCPU 100% busy and the others idle, the reported PercentIdleTime would be 75. The first four counters should sum to 100%. The last three counters also sum to 100%; they subdivide the sum of PercentProcessorTime, PercentIOWaitTime, and PercentInterruptTime. To obtain a single metric aggregated across all processors, set "condition": "IsAggregate=TRUE". To obtain a metric for a specific processor, such as the second logical processor of a four-vCPU VM, set "condition": "Name=\\"1\\"". Logical processor numbers are in the range [0..n-1]. The Memory class of metrics provides information about memory utilization, paging, and swapping. This class of metrics has only a single instance. The "condition" attribute has no useful settings and should be omitted. The Network class of metrics provides information about network activity on an individual network interfaces since boot. LAD does not expose bandwidth metrics, which can be retrieved from host metrics. Although this class is instanced, LAD does not support capturing Network metrics aggregated across all network devices. To obtain the metrics for a specific interface, such as eth0, set "condition": "InstanceID=\\"eth0\\"". The Filesystem class of metrics provides information about filesystem usage. Absolute and percentage values are reported as they'd be displayed to an ordinary user (not root). Aggregated values across all file systems can be obtained by setting "condition": "IsAggregate=True". Values for a specific mounted file system, such as "/mnt", can be obtained by setting "condition": 'Name="/mnt"'. The Disk class of metrics provides information about disk device usage. These statistics apply to the entire drive. If there are multiple file systems on a device, the counters for that device are, effectively, aggregated across all of them. Aggregated values across all disks can be obtained by setting "condition": "IsAggregate=True". To get information for a specific device (for example, /dev/sdf1), set "condition": "Name=\\"/dev/sdf1\\"". The command assumes you are using the Azure Resource Management mode (arm) of the Azure CLI. To configure LAD for classic deployment model (ASM) VMs, switch to "asm" mode (azure config mode asm) and omit the resource group name in the command. For more information, see the cross-platform CLI documentation. Based on the preceding definitions, here's a sample LAD 3.0 extension configuration with some explanation. To apply this sample to your case, you should use your own storage account name, account SAS token, and EventHubs SAS tokens. "displayName": "Used disk space on /"
The resourceId in the configuration must match that of the VM or the virtual machine scale set. Azure platform metrics charting and alerting knows the resourceId of the VM you're working on. It expects to find the data for your VM using the resourceId the lookup key. If you use Azure autoscale, the resourceId in the autoscale configuration must match the resourceId used by LAD. The resourceId is built into the names of JsonBlobs written by LAD. The performanceCounters data are always stored in an Azure Storage table. Azure Storage APIs are available for many languages and platforms. Data sent to JsonBlob sinks is stored in blobs in the storage account named in the Protected settings. You can consume the blob data using any Azure Blob Storage APIs. 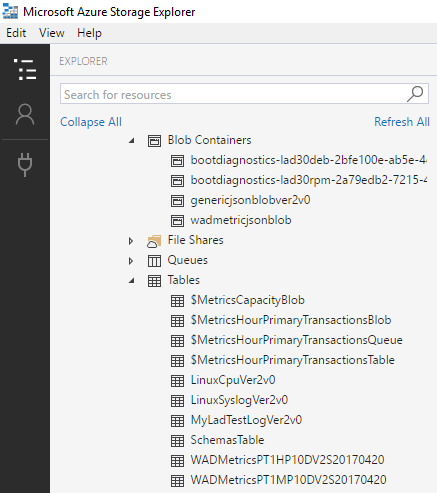 This snapshot of a Microsoft Azure Storage Explorer session shows the generated Azure Storage tables and containers from a correctly configured LAD 3.0 extension on a test VM. The image doesn't match exactly with the sample LAD 3.0 configuration. See the relevant EventHubs documentation to learn how to consume messages published to an EventHubs endpoint. 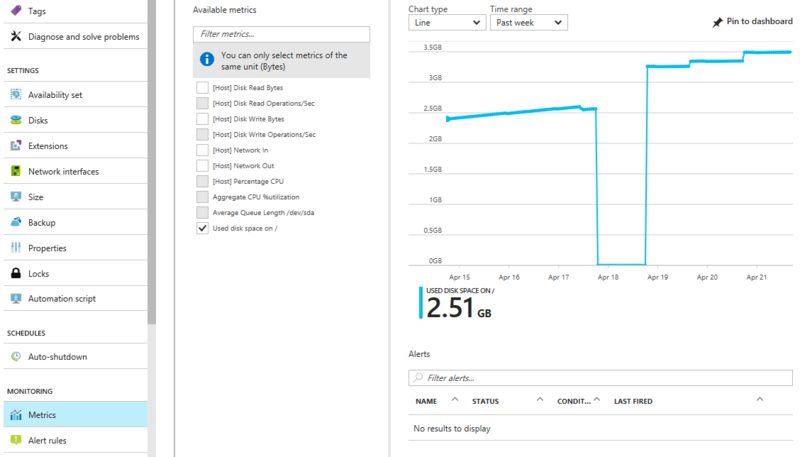 Create metric alerts in Azure Monitor for the metrics you collect. Create monitoring charts for your metrics. Learn how to create a virtual machine scale set using your metrics to control autoscaling.